A representation of a brook trout is now available on Abel Reels by Montana artist Derek DeYoung. The hand-painted DeYoung brook trout flank pattern is priced at $200 over the standard cost of any reel, with the option of a matching drag knob for an additional $50. DeYoung’s trout representations on Abel reels have become both artistic fly-fishing additions and collectors’ items. Michigan native DeYoung was raised on the shores of a lake, where he and his two brothers chased panfish, largemouth bass and northern pike. His career as an artist began around that same time as he began to sketch images of the fish he caught. “DeYoung uses bold, bright colors that have become increasingly popular and collectible on clothing, fishing accessories, and exclusively on our reels,” said Don R. Swanson, Abel president. 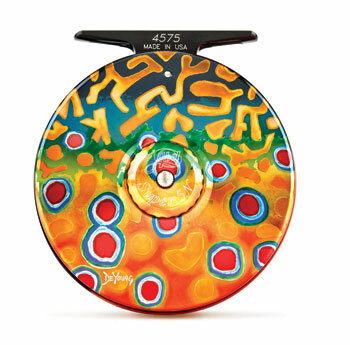 “It takes our Abel factory artists more than six hours to hand paint each DeYoung image brook trout flank pattern reel, but the final product is something to enjoy for generations,” said Swanson. The California tackle manufacturer produces 20 models and sizes of reels in five series: Trout, Abel Creek, Super, Super Quick Change, Spey and Switch. Reels are fully machined – not die cast – using 6061-T651 aerospace-grade aluminum, aircraft bearings and high-grade cork on their drag system reels. All reel design, manufacturing and anodizing is done in-house, with no outside sourcing. Polarized Glasses - Always Carry Two Pair?